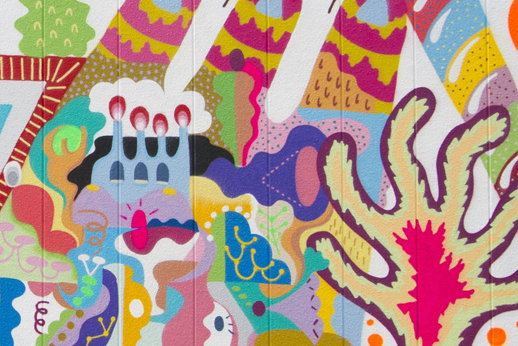 In equal measures abstract, figurative and pop, Mina Hamada & Zosen’s Spring Mural (2013) colorfully covers the outer wall of a skate park in Saitama. 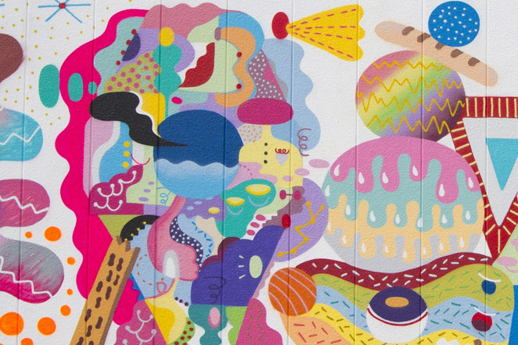 Having cultivated a bright and playful style with, in this case, almost edible motifs, Hamada and Zosen have been painting murals in public together for several years now. 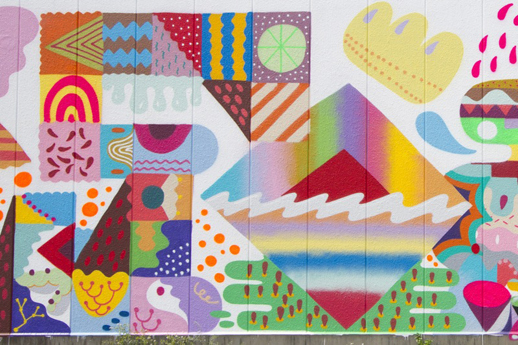 During her brief visit to Tokyo, we spoke to her about their vast, decorative work Spring Mural to find out how they approach the task of making a public artwork. Thank you for sparing your time to meet while you’re visiting Tokyo. I know you’re based overseas now. Are you from Tokyo originally? I was born in Louisiana in the U.S.A, but I grew up in Tokyo. I moved to Barcelona in 2009 and I’ve been living there since. I’ve heard that street art in Barcelona is everywhere. It sounds like a really vibrant scene. It’s changed a bit recently. When I first arrived in Barcelona it was different. I made many friends making art and painting murals and doing graffiti. They were so nice and open-minded and took me with them to paint. At first I was quite shy, but little by little, I began to feel more comfortable working outside. This is how I met Zosen and we began collaborating on murals together. Tell us a little more about Zosen. He grew up in Buenos Aires, Argentina didn’t he? Yes, but he’s lived in Spain for years now. We met in Barcelona in late 2011 and I was very lucky to meet him. Since we started painting together, I’ve learned many things from him and we’ve shared a lot of experiences. We have different personalities and we come from different cultures, but we understand each other very well. We like this kind of mix, too. Did traveling overseas influence your work at all? I traveled to Mexico about ten years ago. Although I was only there for about a month, Mexican crafts, folk art and murals made a really strong impression on me. It was so special to me that I even thought about living in Mexico for a while, but I’m happy to live in Europe now. 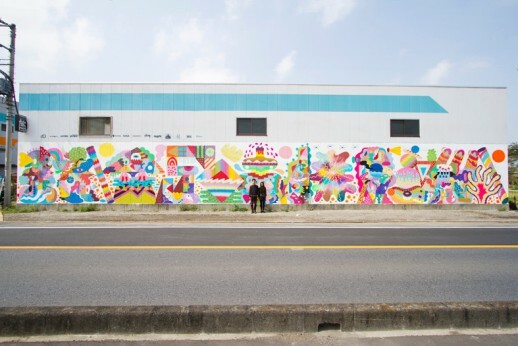 How did Spring Mural in Saitama come about? It happened thanks to Kenshiro of Urban Force and Makoto of Montana Colours Japan. Urban Force is a group of artists, designers and DJs based in Tokyo. Kenshiro is the artist who previously had a work on the wall of FUG Skatepark. Makoto kindly offered to provide us with the spray paints, so we went to work. It’s made with entirely with spray paints then. Do you always use spray cans? 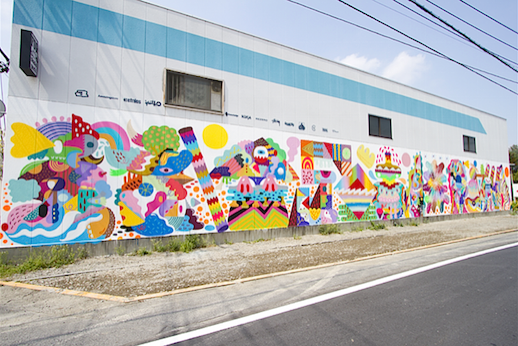 We used only spray cans in Saitama, but we apply paint any way we can. When we worked in South America, spray cans were so expensive that we used paint brushes instead. It just depends on the circumstances. Of course, spray paints are usually the fastest way to paint. After painting the wall white first with some friends, it took us four days to finish Spring Mural. Did you do any drawings or preparatory sketches before you arrived in Saitama? No, we like to work intuitively. We don’t plan things out beforehand. We let the mural grow as we work on it. With this mural we worked from left to right, but it depends on the wall itself. Sometimes we need to use raised platforms and ladders, when we’re painting high up. But this wasn’t so high so we could paint at street level. How do you know who paints where? For Spring Mural we divided the wall into sections and then worked on those sections individually. As there were already these sort of panels marked out, it was easy. But while we paint our own sections, we also fill in parts of the others’ section, too. We somehow naturally develop the motifs of the work once we’ve got started. We don’t know how it will look when it’s finished. We both want to be surprised by what we make. Do you find that you or Zosen are more likely to paint some things more than others? Well, I normally paint more abstract forms, whereas in Zosen’s paintings you can find a lot of characters. He often paints funny faces, legs or animals. When we paint together, my shapes are changed sometimes. For example, if I paint a circle, when I next look around at it I’ll see that the circle has become a dog or a small face or something. So this mix can be funny. How do you feel about painting publicly? I like communicating with local residents. For me, this is one of the interesting aspects of working outside. You get to meet old people who see what you’re making and they revisit you. Of course, painting in front of everyone wouldn’t suit every painter, but it can be rewarding to be among a community. The only time that this doesn’t work is when you paint on a raised platform and you’re at a distance. Does working on such a large scale make a difference to you? I like to paint large walls just as much as I do painting in small books. Both are exciting for me. It is funny sometimes, though, when I’m painting a mural on scaffolding, wearing a helmet, jumping up and down on raised platforms, I feel like Super Mario. Are there any motifs that recur, irrespective of scale? There are things found in nature – trees, streams and mountains – that recur in my work. I like to use organic shapes. I like making marks and gestures using shapes found in nature. Following the flow of a river or the curve of a stream leads me to the next shape. Most of all, I want to be surprised by what I paint and this happens through the process of making. Directions: FUG Skatepark, 3-3-25 Kami-Muneoka, Shiki-shi, Saitama, 353-0001. Yanasegawa Station is on the Tobu Tojo line. The mural is about a 25-minute walk from the station.